Chocolate Pizza Company’s annual Open House sale runs now through November 7th. Customers can save 20% off online or in-store purchases. To save online, use coupon code: OPENHOUSE on checkout. The company’s only sale of the year is a huge hit with customers who like to get their holiday shopping done early. “Our customers order now with the 20% savings and schedule their holiday shipments or pick-up,” says owner, Ryan Novak. He notes that being able to complete a lot of holiday shopping early is a big relief to many customers. 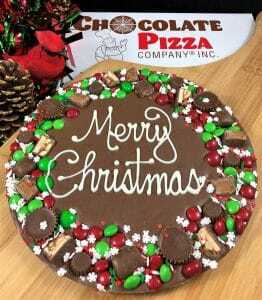 While Chocolate Pizza Company’s entire product line is on sale, it is the Christmas specialties that draw the most attention. One of the most popular choices is the Holiday Avalanche Wreath Chocolate Pizza. Gourmet chocolate is blended with homemade toffee and poured into pizza pans. Chocolatiers then create a “wreath” border from chocolate and peanut butter candies in holiday colors. “Merry Christmas” or “Happy Holidays” is hand-scripted in white chocolate to complete this unique gift. The Holiday Avalanche Wreath is served in a custom pizza box. Meanwhile, it is no secret that many customers choose to make their Chocolate Pizza a Combo by adding Peanut Butter Wings. Chocolate Pizza Company is famous for these salty-sweet bites. Crisp, rippled potato chips are covered in creamy peanut butter and drenched in rich milk or dark chocolate. For the holidays, there is a one-pound size that comes in a festive metal tin. But “pizza & wings” are just the start. 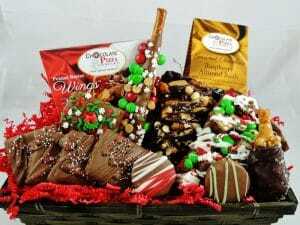 For example, Chocolate Pizza Company offers beautiful holiday gift baskets that are as impressive as they are delicious. Customers will find more than a dozen varieties of gift baskets filled with handcrafted chocolate specialties like a Holiday Avalanche Slice, Caramel & Nut Drumstick, S’more Treat, Peanut Butter Sparkler, chocolate covered cookies and more. Craving more traditional treats? Not surprisingly, Chocolate Pizza Company has you covered. Chocolate covered potato chips, pretzels and almond bark are all available in gift-ready 6 ounce packages. But there is more to love in the “Feed Your Cravings” category. Toffee Nut Crunch is a classic confection that makes a delicious holiday stocking stuffer. The homemade English toffee is made on-site, in small batches by the owner. The recipe is local and dates back to 1919. Bubbling away on the stove-top, the aroma of toffee is heavenly. But once cooled, it is stretched and covered in rich milk or dark chocolate. 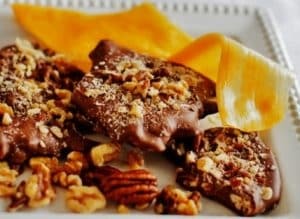 Chocolatiers finish the Toffee Nut Crunch with pecans and walnuts for an incredible treat. So for a classic, Toffee Nut Crunch is hard to beat. Moreover, any of the handcrafted treats are welcome additions to a Christmas stocking. Chocolate Pizza Company and owner, Ryan Novak, have been featured nationally on Food Network, Hallmark Channel, CNBC, CMT and in Forbes, People and Entrepreneur magazines. Internationally, both Discovery Channel India and Food Network Canada have introduced Chocolate Pizza Company to global chocolate fans. The website receives orders from 6 continents. In 2015, the company built a 10,000 square foot production facility in Marcellus, New York. Ryan has overseen the transformation of a small-town chocolate shop into Central New York’s largest chocolate maker. In 2016, Chocolate Pizza Company was selected as “Business of the Year” for employers with under 50 employees.